While aboard a whale watching flight with Wings over Whales in Kaikoura, NZ, we were lucky to capture this aerial picture of a Sperm Whale resting at the surface. While traveling with Wings over Whales, a whale watching flight tour in Kaikoura, NZ, passengers have a 95% chance of capturing an aerial view of a Sperm Whale. This picture gives one the opportunity to see how massive the Sperm Whale is, especially while it spends a few minutes resting on the surface. With its tail and part of its head slanted towards the depths of the water, the Sperm Whale exposes some of its backside while laying still and resting. The sound of the plane while soaring above does not seem to bother the resting whale and a Sperm Whale in this state is fairly easy to approach. Aerial of a Sperm Whale resting in the waters off the coast of Kaikoura, NZ from a chartered flight with Wings over Whales. ... The Sperm Whales are regular visitors in these waters off Kaikoura, NZ and while aboard the 30 minute whale watching flight, everyone scans the water in search of them. Sperm Whales off the Kaikoura coast will typically dive to depths of 3,000 feet at a speed of approximately 4 knots and return vertically to the surface at about 5 knots. Often disappearing for 45 minutes at a time, all eyes should be peeled as one never knows where the whales will resurface. A male Sperm Whale can reach a maximum length of 22 meters and weigh about 42,000 kilograms while a female is about 17 meters long and 20,000 kilograms. The head of the whale is about 1/3 of its body length and no dorsal fin, only a hump made of flesh and fiber about 2/3 of the way down its back. There are about 4 or 5 humps along its backside which look like a back bone, short flippers and massive tail flukes which are extremely powerful and aid in the speed in which the whale travels. A whale watching flight with Wings over Whales in Kaikoura, NZ is an unforgettable experience and gives one a different perspective of a Sperm Whale. Resting is just one of the behavioral traits a Sperm Whale is seen doing, others include spyhopping, breaching, pectoral slapping, traveling or simply rolling about in the water. 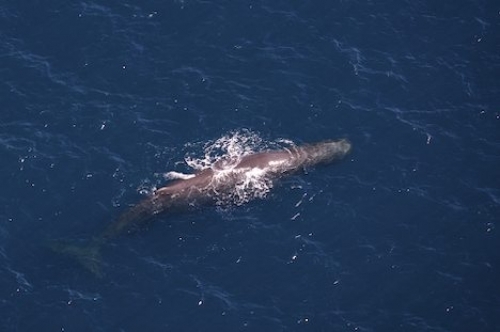 Aerial view of a Sperm Whale resting on the surface of the water during a Whale Watching flight with Wings over Whales, Kaikoura, East Coast, South Island, New Zealand.